Shiv Nadar University Result 2018-19: Shiv Nadar University is a private university situated in the National Capital Region (Greater Noida, UP) of India. Established in the year 2011, SNU was launched by the Shiv Nadar Foundation funded by the billionaire industrialist and founder & Chairman of HCL Shiv Nadar. SNU has 5 schools and 24 academic departments offering various undergraduate, postgraduate and doctoral programs in the field of Humanities, Science, Engineering, Management etc. The medium of instruction in the university is English. SNU has 1828 students enrolled in its undergraduate programs. The university campus is spread in an area of 26 acres that has 6 academic blocks, 154 lab and studios, 9 hostels, 15 sport courts, gym, and dining facilities. SNU has been ranked 72 overall and 48 under universities category by The National Institutional Ranking Framework (NIRF) in the year 2018. The admissions in the university are carried out on the basis of merit and entrance exams. The academic year follows a semester system and divided into two semesters viz. Monsoon semester and Spring Semester. The semester exams or end term exams are conducted at the end of the semester. Below, we have shared the complete information about Shiv Nadar University Results. SNU grants admission to the students on the basis of national level entrance test like JEE and various entrance exams conducted by the university itself. Academic Proficiency Test (APT) and Shiv Nadar University Scholastic Aptitude Test (SNUSAT) are some of the entrance exams conducted by the university. University also grants admissions in few courses on the basis of marks obtained in the qualifying exam. The admission procedure starts in the month of April. All the interested candidates are required to fill an online application form. Students can appear in the university entrance exams in the month of June. The final selection of the students is done on the basis of the scores in the entrance test, marks in qualifying exams and deep observation of application and documents. The academic session starts in the month of July every year. University curriculum follows a semester system which means an academic year is divided in two semesters i.e. the Monsoon Semester (July to December) and Spring semester (January to May). University conducts mid-term exams and end-term exams for each semester. The mid-term exams for monsoon and spring semester are conducted in the month of September and March respectively. The end term examinations for monsoon semester are held in November/ December every year. For Spring semester, the end-term exams are conducted in May. Students are required to fill an online exam registration form. University thereafter, issue admit cards to the registered students. It is also compulsory for all SNU Students are also required to carry a valid admit card/ hall ticket to the exam hall on examination. No student is allowed to enter the exam hall without a valid admit card and is not permitted to write the exam. SNU declares the end-term result for Monsoon semester in December month. On the other hand, the end term result for the Spring season is declared in the second week of May. The end term result is declared only through the online mode. No hard copy/emails of the result are sent individually to any of the student. The result sheet of the student consists of information like student’s name, registration number, roll number, course/program, semester, year, subject-wise marks/grades, total marks, result etc. In case of any discrepancy in the result, students must immediately contact the concerned university department. After the online publication of the result, students have to collect their mark-sheets from the concerned university department. SNU publish all the information regarding exam and results on its website. Therefore, enrolled students are advised to stay in touch with the official university portal in order to get each and every update about the university result. 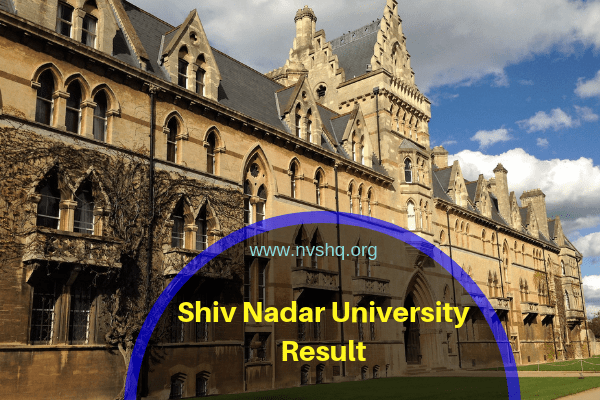 How to check Shiv Nadar University Result? Click on the “students” tab at the top of the homepage of the website. Check the result and download the same for reference in the future.